I haven't been there in ages, but I love Swan Oyster Depot (and Googling for the address, I saw a Twitter shoutout from LTH'er Mike Nagrant). * No reservations, one counter with about 20 seats and no tables. * Regardless of what you go, expect a line, but it moves quickly (and is worth the wait). A lot of their fresh seafood is displayed in the window, so you'll have some idea of what's to come. * At least half of the guys behind the counter look like their related (and I think they're mostly brothers). * Everything is made on the spot--usually in front of you. * Oysters on the half shell, crab claws, seafood cocktail and seafood salad (with thousand island dressing, I think) are some of the highlights. * Most (everything?) includes a hunk of fresh sourdough bread. * Wash it all down with an Anchor Steam beer. * When you ask for your check, you're likely to be asked, "What did you have to eat?" As I think of my year in the Bay Area, I have discovered that San Francisco restaurants are adept at producing stylish, creative cuisine at prices that 20-somethings can afford. Yes, there are some extravagant restaurants and, frankly, some rotten ones, but SF has a mid-budget culinary swagger that few cities can match. Perhaps this is a function of the fact that SF is a youthful, vibrant city and a city where people dine out: seven meals at $150/per is more Silicon Valley than Noe Valley. Several restaurants might be named as fitting this category: Delfina, Zuni Café, among others. But as I managed to snare a rare reservation at Flour + Water, a sophisticated modern Italian restaurant in the Mission District - a restaurant that is Pizza-plus – F+W is my text. 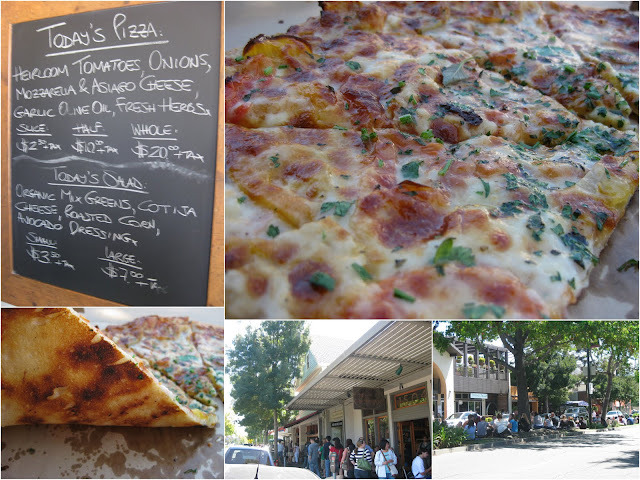 Flour + Water charges $17 for pasta, $16 for pizza, and $21-24 for their secondi. The restaurant is well-priced and always filled. It is the Eternal Seating. My companion and I ordered a pair of antipasti, two pasta, and a secondi, and were, in general, quite impressed: three of the five were distinguished. Pork belly with broccoli salsa gribiche, asparagus, sofritto, and fresh coriander was marred by a small and overly crispy pork belly. 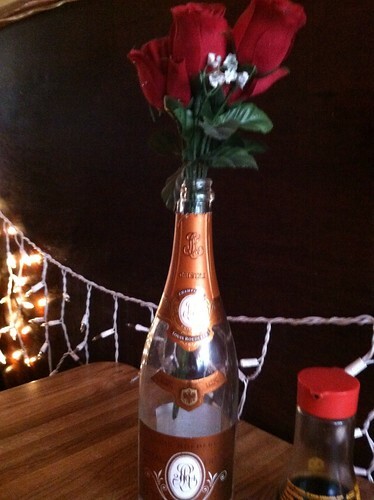 It was pretty, but not truly delicious. 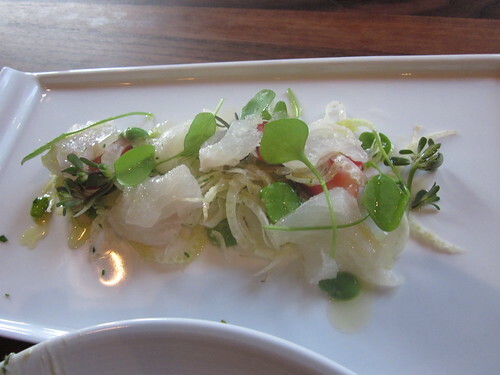 In contrast, the halibut crudo with strawberries, favas, and fennel blossoms was a cool tribute to spring. 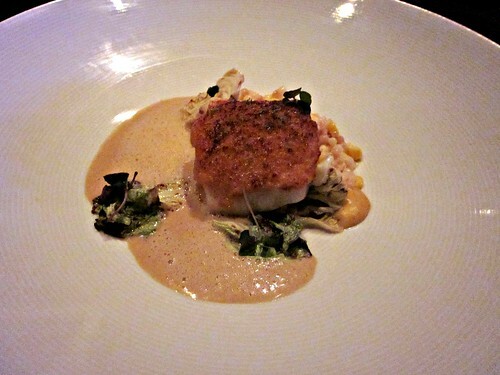 The fish was sweet and the accompaniments added layers of textures. The tasting notes were just right. The path of pasta diverged. One was fabulous, the other sounded fabulous when read on the menu. 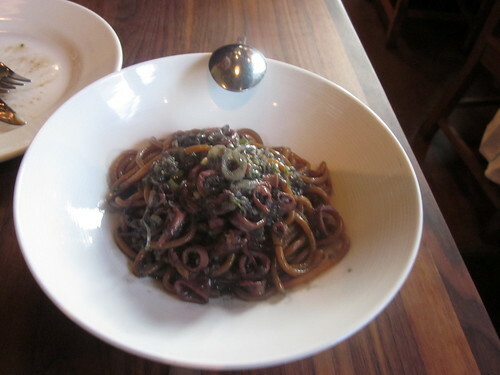 Less successful (and not a choice that our server recommended when asked for pasta advice) was Aleppo Spaghetti with Ink Braised Squid, Mint and Chili Oil. Aleppo is a mild Syrian pepper. 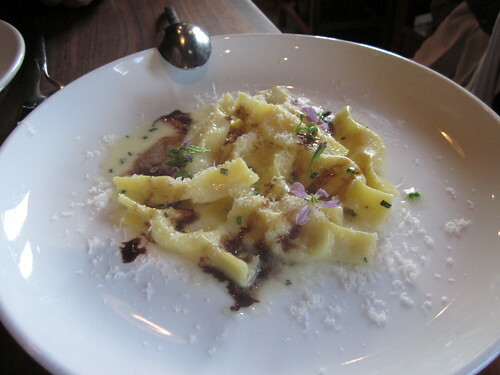 While the pasta was properly cooked, the plate with its black and brown tones was not inspiring and the flavors, presumably intended, seemed a bit off. Mint and chili did not match well. Braised squid was not as pleasing as the grilled version. In contrast, the Taleggio Scarpinocc with Rosemary and Aceto Balsamico (which our server enthusiastically admired) was stunning in its simplicity. These oddly shaped raviolis (shaped like wooden shoes) were luscious, and were as fine a filled pasta as any I have had for months. The cheese was astonishingly tangy. 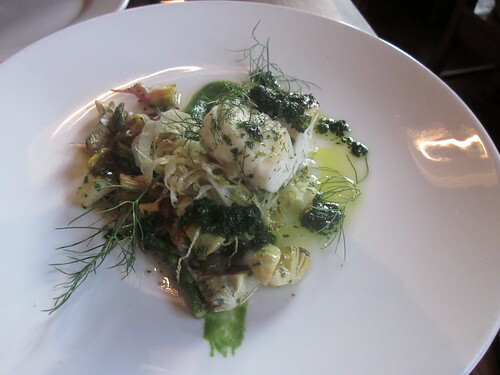 The secondi – slow cooked cod with artichokes, spring onion, asparagus, pounded herbs, and fennel – was lovingly prepared, elegantly presented, and carefree. If it was not as savory as some main courses, its subtlety carried the night. The lightness of the fish made it float away. With Flour + Water only a few blocks from Humphrey Slocombe Ice Cream, a post-modern ice-creamery (Brown Butter Ice Cream and Malted Dulce de Leche), we didn’t test the F+W desserts. We left F + W with wallets only slightly lightened and hearts greatly so. My wife and I are going to San Francisco for a weekend in 2 weeks and did a lot of research on where to eat while out there. Based on the recommendations of quite a few people, we are going to the Slanted Door when we arrive. We are also planning on visiting Nopa (supposedly have a great burger) and a place called Namu. We would like to eat at least once in chinatown as well. Just recently stumbled across this site and think it is fantastic, my productivity at work has certainly taken a hit since discovering. Wondering if anyone has been to Nopa/Namu or had any can't miss places around chinatown that maybe are not posted elsewhere on the site. Will report back on how our trip goes if nothing else. I was very impressed with the neo-Vietnamese food at Slanted Door, but less impressed by the jangly (hectic) atmosphere. Try to avoid their busiest times (which might coincide with whenever they are open!). Surprisingly I have been less impressed with the Chinese food that I have had in SF, and perhaps I haven't found the right places. So I will look carefully if others make recommendations. The best Chinese food that I have had in SF is in the opposite (SW) corner of the city from Chinatown, the Old Mandarin Islamic Restaurant, just off Sloat Blvd (Vicente Avenue) and 43rd Avenue, near the Zoo. In contrast the Italian food has been terrific. I have been searching for outstanding Chinese food in the San Francisco Bay Area, although most of my finds have not been post-worthy. However, I did find Yum's Bistro (in Fremont - see this thread above) and The Old Mandarin Islamic Inn. But now I have a third to add, 5 Joy, located by the Bay in Foster City. It is a Taiwan style restaurant, which once had a "secret menu," but now most of the secrets are on the full menu (see 5 Joy Secret Menu for the old secret menu). To be fair, the reviews have been fair to good, and I base my opinion on one take-out order, but I was impressed, particularly with the Chunghua Road Potstickers (long-cigar like pastries filled with gingered meat), beef with orange dry peel, a spicy chicken dish (three cup chicken) and mu-shu hand cut noodle chow mien. Each was notably good, and there was a lot more on the menu that I plan to try if time permits (Eel Paste with Leek, Shrimp with Lily Buds, Curry Fish Head in Clay Pot, Hot dry noodles-Hupeh style, Red-striped whole Duck, and others). If you are south of SF (it is about 20 minutes from the airport), I recommend 5 Joy. For Food Nut's take see Review of 5 Joy with photos. I didn't order any of the dishes that FN didn't like. Often young chefs find a horsey-style and ride it, but not so Dominique Crenn who is working with flair to harness her own vision. She has been in the industry for some 23 years, and perhaps “young” is a matter less of chronology than the fact that she only reached wide gastronomic notice in 2008 when she became chef at San Francisco’s Luce, received a Michelin star, and was named Esquire’s chef of the year. She has since triumphed on Iron Chef, which might or might not testify to her vision, but certainly to her culinary chops. Although she had worked with Jeremiah Tower at Stars according to her bio, she does not have the golden resume of some colleagues. Perhaps she is not self-taught, but she is not a sponge of others’ visions. This past year, Crenn branched out on her own, opening Atelier Crenn, a workshop for her own “Poetic Culinaria.” For those who hope that their chef is not only a creator of the idea of dishes, but also an overseer. She is a working chef, working the kitchen and the dining room both. Perhaps in a few years, this will not be so, but it is clear that neither she nor her food is set in amber. Having a chef visit one’s table is, perhaps, worth a third of a star alone. Even if her culinary history does not reveal many mentors, she is a public figure with a biography. Crenn is apparently the adopted daughter of a prominent French politician, although I have been unable to discover which one (one hopes not the other Dominique: the ill-starred Strauss-Kahn). She was raised in Versailles, and after her mother took ill when she was nine, she determined to cook for the family. She and her papa and his friend, a prominent food critic, would visit the high-end boîtes of Paris. Much of her professional cooking has been in California, particularly in the Bay Area. She is edging ever closer to becoming a celebrity chef, and one of the relatively few female chefs who are in serious and sustained dialogue with modernist cuisine. The menu includes a moving (and somewhat ambiguous) letter to her father, talking about pain and sun, surf and sweat. As with so much poetry, readers have much to read in, but one can hardly imagine a male chef making the claim that his cuisine is such a personal and private expression, a way of reliving the past, whether troubled or happy. Ultimately reviews are about the food. Critics are often asked, reasonably, how good was it? Asking that of Crenn is a bit like asking that of, say, Eva Hesse or Robert Rauschenberg: they don’t easily fit on a 30-point scale. They are important artists with a vision that might or might not appeal and techniques that might or might not be proficient. The most obvious limitation of Crenn (and for that matter Rauschenberg) is that her dishes are not noted for their precision. If you admire Thomas Keller’s perfection on a plate, this falls short of that standard. Perhaps Crenn doesn’t have the staff, but I think she doesn’t have the desire. Memory doesn’t work like that. She is attempting to produce remembrance and reverie. Whether she succeeds is as much a function of the diner as of the cook. We four diners ordered all eight of the dishes on the savory menu (all the photos are to be found on my Flickr account page: http://www.flickr.com/photos/52391789@N00/with/5796811013/. But I realized that having a bite didn’t do justice to a plate that was designed to be savored and to be considered. So I focus on the dishes that I ordered. 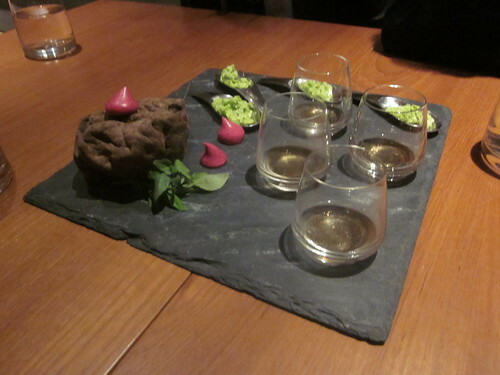 We began with a quite lovely and evocative amuse: a spoonful of freeze-dried split pea soup, a bloody-dried beet “kiss,” an intense bit of fungal broth, and an non-edible boulder. It was quite a stunning composition: possibly Freudian, but perhaps freeze-dried split pea soup is simply freeze-dried split pea soup. 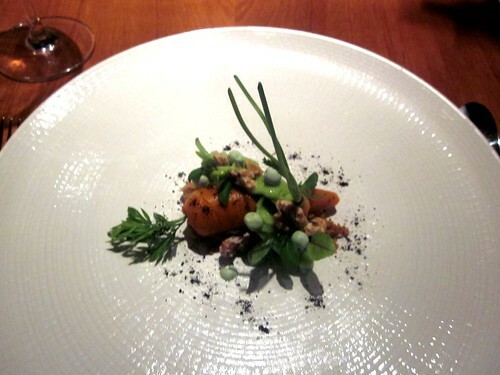 The consommé was properly intense, the beet was deeply flavored – a root with a zing. The bright freeze dried pea soup didn’t wow my tongue. The crumbly texture added little to the enjoyment of the flavor, but distracted a bit. My opening course (diners can choose any three dishes from the savory portion of the menu) was a “Walk in the Forest,” a composition of textures and aromas of the wild. I imagined that it was going to be similar to David Kinch’s iconic “Into the Vegetable Garden” salad, a bowl of local surprises. It wasn’t quite. 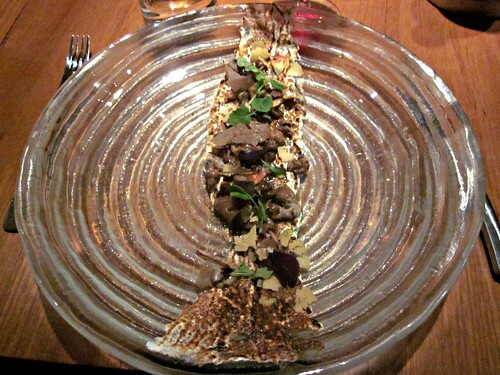 The plate was coated with a pine paste (a surprisingly sticky and sweet paste, more keeping with dessert), covered with various forms of mushrooms, the raw and the cooked and the pickled: a delicious black trumpet mushroom paper, picked and pickled morels, champignons, added were hazelnuts, chestnuts, tiny lettuces, toasted pumpernickel, and sorrel oil. I was glad to have selected the dish and I surely will remember it, but I don’t quite know what to make of it. As a culinary matter, it was somewhat too sweet and too pickled (Crenn seems to enjoy the tang of pickling). The plate was remarkably creative as an idea, and just a bit off as culinary practice. 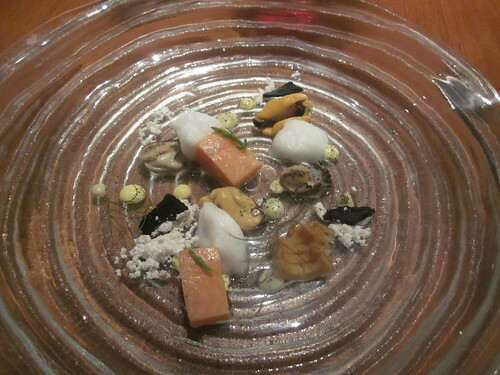 My second plate was poetically entitled, “The Sea, An Interpretation of Aquatic Flavors: Mussels, Oysters, and Arctic Char.” As I have previously suggested, the modernist style of dessert is to present the diner with a mix of preparations. The Sea, not so sweet as the previous dish, had this same decentered quality. Crenn prepared abalone, smoked oyster, char, mussels, squid ink meringue, and dehydrated lemon foam. It was quite charming in its ingredients and preparations and beautiful in its presentation. However, not having lived Crenn’s life, I wondered about the poetic imagery of the dehydrated foam. What might it signify? Still, it was a very worthy dish: a collection of satisfactions. 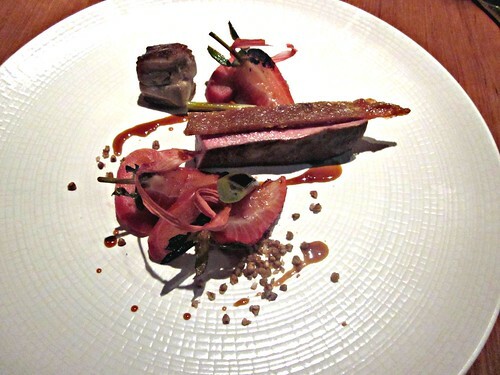 My main protein was more standard: Duck with crispy skin, spring garlic, strawberry, rhubarb and smoked buckwheat. 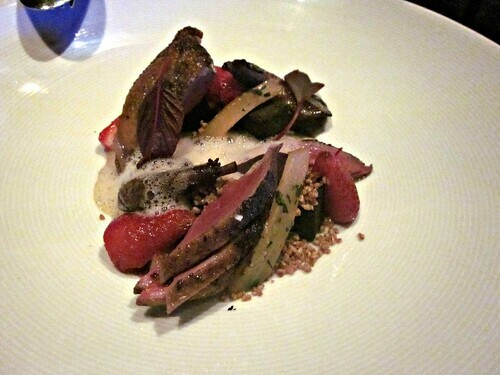 I recently ate a magnificent duck entree at Coi; Crenn’s was more exuberant and less precise. Still, it was an excellent use of big protein. I particularly admired how she sprinkled toasted buckwheat on the plate as if buckwheat was salt. 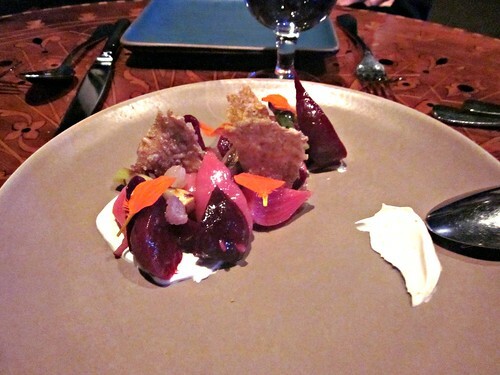 It stood in contrast to Patterson’s carefully composed accompaniment of radish and wheatberries. Crenn’s duck was a special preparation, well within the modernist canon. Finally dessert (from pastry chef Juan Contreras) was a witty trompe l’oeil: a carrot cake with spring pea cream. The joke was that the cake was within the hunky frosted “carrot” with tiny carrots and frozen peas as accompaniments. Perhaps the cake itself tasted no better than a routine carrot cake and the cream was more clever than wondrous, but still it was a pleasurable ending to a most distinctive meal. Michael Bauer, the lead critic at the San Francisco Chronicle, awarded Atelier Crenn a disappointing two-and-a-half stars in April, complaining not about ideas, but execution (and an average wine list). My meal (and those of my companions) in June deserved more credit, even if the cooking of ingredients is not quite at the level of the best of the San Francisco restaurants. Still, when a chef is still at work in the kitchen and the ideas are bubbling and bouncing, Atelier Crenn stands a good chance of being a better restaurant in December than it was in June. Even now, it is a restaurant that is always thought-provoking and vibrant. Chef Crenn, trying to capture her past and to share it, has a distinctive, potentially influential, gastronomic voice even if not all the songs are lullabies. I wanted to post some photos from Aziza, the modernist Moroccan restaurant in the Outer Richmond of San Francisco. The meal was sophisticated as modern cuisine and a tremendous bargain ($65 for three courses (a shared dessert), drinks, tax, and tip). The food might have been more influenced by Moroccan flavors, but in several dishes there was a bit of the Middle East - spiced rye, licorice, young almond, lamb, and the decor had some Moroccan flair. 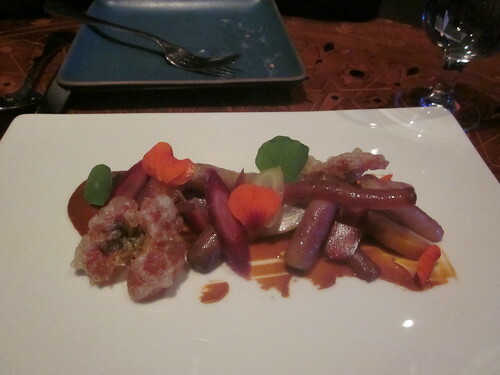 Still, while Aziza is not a truly Moroccan restaurant, it is a very fine one - certainly nothing like it in Chicago. 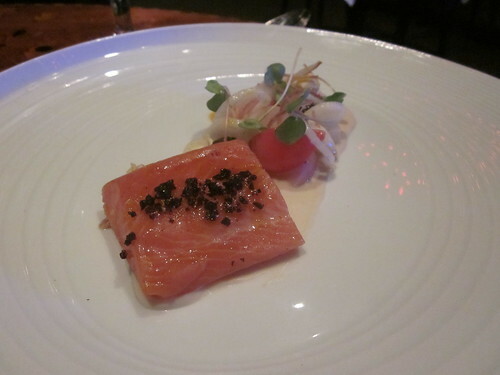 The Beet, Ocean trout, and Halibut were particularly distinguished, but there were no losers in our seven choices. I can recommend Aziza strongly as a moderately priced restaurant. My most recent trip allowed us to explore the East Bay for the first time. My husband received a strong recommendation to check out Brown Sugar Kitchen in an industrial area of Oakland. We went for brunch on a weekday morning to avoid the weekend crowd. We both ordered the fried chicken and waffle. The fried chicken was perfectly seasoned and you could see the bits of freshly chopped herbs in batter. The skin was crispy, and the chicken was tender and juicy. Best of all, it didn’t feel overly greasy or heavy. The cornmeal waffle was incredibly light and crispy. When I think of cornmeal, I often think of dense, dry cornbread, but I’m always amazed at how light cornmeal can be. This chicken and waffle combination was divine and worth the trek. We then ended up in the same area as Bakesale Betty’s. I’m not even sure how I came across to learning about it. Again, it was one of those places with a long line spanning multiple storefronts. Old iron boards and wooden stools lined the sidewalk for patrons to eat outside. Since we were already there, we couldn’t resist ordering the signature fried chicken sandwich. A boneless, skinless chicken breast is fried and topped with a light jalapeno coleslaw. The batter on this fried chicken was crunchier than breakfast, which was crisper and lighter. I think the star of the sandwich is the coleslaw. It’s a far cry from one of those overly creamy messy coleslaw salads. Instead, it’s a light vinaigrette dressing that has a healthy punch from the jalapeno slices. I think they recently posted the recipe online, so I will have to add it to my recipe box. We also picked up a chocolate chip walnut cookie and a strawberry shortcake. I was disappointed in my chocolate chip walnut cookie as it did not taste as good as the NY Times recipe. Strawberry shortcake is one of my husband's favorite desserts, and so he couldn’t turn it down. The shortcake was a true shortcake in the sense that it was not a spongy pound cake, but rather closer to a biscuit. I learned about the Cheese Board Collective while researching Berkeley and the Gourmet Ghetto. It also came highly recommended by a local Chicago pastry chef. The pizza operation started informally when the staff made pizzas at the end of the day for themselves. This became so successful that they expanded their store front to serve pizza. What’s really unique about their set up is that they only make one type of pizza a day - no substitutions, additions or subtractions on the toppings. The pizzas are always vegetarian and made using their own cheese and some locally sourced produce. The line is always out the door, and the median on Shattuck is littered with groups of people picnicking with their pizza boxes from Cheese Board. Don’t be intimidated by the line though, it’s very efficient and fast moving since the choices are limited. You can order pizza by the slice, half or whole. They have a daily salad in two sizes and a dessert. We ordered half a pizza for lunch, and on this day the toppings were heirloom tomatoes, asiago, garlic and herbs. The cheese was chewy, and the crust was thin, chewy and crispy all at once. I loved it! GAF wrote: I have been searching for outstanding Chinese food in the San Francisco Bay Area, although most of my finds have not been post-worthy. However, I did find Yum's Bistro (in Fremont - see this thread above) and The Old Mandarin Islamic Inn. Based on GAF's comments and some local support, I trekked out to this relatively obscure corner of SF. (I agree that it's surprisingly tough to find great Chinese in a city where the person next to you is as likely to have been born in China as anywhere else, and very tough to spot regional variation in or around Chinatown proper -- it's a Cantonese town, and I have some favorites there discussed upthread.) At Old Mandarin I stuck to core northern dishes, each of which will be familiar to anyone who has dined at, say, Lao Beijing or Ed's, with each dish either listed as a specialty or recommended by the house. "Family style pancakes", called "Northern style" at Lao Beijing, were just OK: a bit dense and undercooked in the middle, sliced into wedges rather than shredded. Mandarin lamb, similar to the cumin-heavy lamb dishes at Ed's and Lao B. was a solid rendition that benefitted from velveting but relied on powdered cumin as opposed to toasted whole seeds. Cold bean paste noodles were good, showing off possibly house made or at least locally made noodles on par with Lao B. and a few steps behind Katy's here. 5 spice cold beef was a subtle prep, though I enjoyed the tendon-to-meat ratio that favored gelatinous knuckle. Though the place is "Islamic" and has signs indicating Ramadan menus, Old Mandarin does serve beer, which I enjoyed with the house chili oil. I really love this brand of regional Chinese cuisine, with Katy's and Lao Beijing being 2 family favorites. Old Mandarin would definitely make it into the rotation here for me, so I very much appreciate the advice. This is not a place you'd stumble upon. A place that you very well might stumble upon, Nettie's, near Pacific Heights, was a great call for a big group that included kids. It's a stylish, chef-driven neighborhood spot that manages to appeal to families without compromising much. It shares the New England shore theme that seems to have taken hold everywhere these days, and especially puzzling to me, in regions with their own seafood cultures (the better reviewed seafood places in Naples, FL last month tended to have New England bents). Nettie's made very good use of local dungeness crab in things like devilled eggs and crab rolls that were heavy on clean, sweet crab and light on mayo. I had a sea bass special that was simple and good, but later found out the fish was from the Atlantic. Good nonetheless. Another NE nod was house made butterscotch pudding -- subtle, not too sweet, but very rich. A good way to end the meal. The value was strong at Nettie's, with drinks and kid's stuff being a relative steal. The sleepers on the menu are the vegetable sides. Local kale, Brussels sprouts and beets were all very well done. Unfortunately, Nettie's loses points for haphazard, disorganized and generally clueless service. Specials were not mentioned, things that had been 86ed were, pacing was bad, and there was little communication among the server, bussers and bar. Not a friendly vibe to make up for it, either. More harried than rude, though. From what I read online, the front of house has its documented issues. Other stops on the short trip were Boccalone and Hog Island Oyster in the Ferry Building. Having grown up on big dirty Gulfs, Chesapeakes, and North Atlantics, I'm not as smitten by the tiny, creamy and mild critters at Hog Island. I do look forward to digging into sopressata and 'nduja from Boccalone. Might need to do a side-by-side with the Riv's sopressat. I used to live a few blocks from the Cheese Board. It's a remarkable place. The pastries and bread (and of course the cheese) are also amazing. Pucca wrote: My most recent trip allowed us to explore the East Bay for the first time. My husband received a strong recommendation to check out Brown Sugar Kitchen in an industrial area of Oakland. We went for brunch on a weekday morning to avoid the weekend crowd. We both ordered the fried chicken and waffle. Such a huge fan of this place (save for the wait, of course). Pucca wrote: We then ended up in the same area as Bakesale Betty’s. I’m not even sure how I came across to learning about it. Again, it was one of those places with a long line spanning multiple storefronts. While BSB is fun, I really hope you stepped into the tiny store front immediately to the right of BSB while you were waiting. Scream Sorbet's entire line up is "churned" from Pacojets, and save Chicalicious in NYC, I don't know anyone else touting that. The screaming Paco yields vegan nut derived sorbets that are a little bit spectacular. The flavor profile is unlike anything from the "big" (by big, I mean "not as good") ice cream purveyors in the B.A. Don't get me wrong, I love i'ci, I thoroughly enjoy Mr. & Mrs, and I hate the those who bite slocombe, but Scream stands atop, alone. I had the good fortune to move to Berkeley in January of 72 and while I went to Berkeley (ostensibly to go to school) I never went to Berkeley. It was even then a heady place to be for a gourmand in training. In fact, it's where I started cooking, trying to duplicate food I missed from home and new food I was discovering there. The Cheese Board was @ their original location around the corner on Vine (next to Peets coffee I believe) and Chez Panisse had recently opened as well. Both became my staples and shaped my palate in ways I would come to appreciate later when I became a Chef. It was a crazy time to be there just post summer of love and Peoples Park demonstrations. Patty Hearst was my neighbor (we heard her getting snatched by the SLA but had to turn on the tv to find out what was happening), Harvey Milk was in office and the Zodiac killer was on the loose. So glad to hear they're still on their game. Can't help but smile when I think of those years. Those *were* the days! I spent the Summer of Love in SF, getting MA at State. One of my best friends from college was a lead guitarist of a local, guy named Jorma Kaukonen. SF's first Sichuanese resto opened, and in Berkeley the first Mongolian hot pot place opened. some of us weren't sperms yet. Your loss. You missed quite a party. argh! I wish I had known beforehand. We noticed the sorbet shop, but it was completely empty so we didn't think much of it. Maybe there's a better thread to post about Silicon Valley, but I'm gonna throw a couple of notes in here about Cupertino. There's a much bigger Chinese presence than I realized, and one of the country's best Chinese food concentrations might be inside a strip mall called Cupertino Village. It's a hundred yards or so from 2 big chain hotels, yet I saw not a single non-Asian eating in Cupertino Village in the 4 days I visited. Only made it to 2 places: A & J, a very cheap place that apparently has a location in Rockville, MD too; and Southland Flavor, a still-reasonable but decidedly higher-end place. The standout at A&J was wide noodles with a terrific sesame sauce that had a nice sour note to it. At Southland Flavor, I enjoyed the delicately stuffed fresh tofu with black beans and tried my best to enjoy a plate of pork diaphragm. Anyway, if you're in Cupertino, don't eat anywhere besides this terrific mall. And take the very short drive up the mountains to Picchetti winery, one of the oldest vineyards in California. A small, family run place with some excellent estate Chardonnay and Zinfandel. I've been appreciating everyone's thoughtful posts on SF restaurants. I'll be vacationing there for 5 days in February and have almost all of my eating plans decided. Based on earlier posts, my lunches will consist of Swan Oyster Depot, Cheeseboard Collective, Brown Sugar Kitchen + Scream Sorbet, Burma Superstar, & Zante for Indian Pizza. Bar Tartine for Saturday breakfast & Canteen for Sunday brunch. Dinners are almost battened down. Definitely going to Cotogna & Chez Panisse, but I'm still waffling between some choices. I'm still trying to decide between Locanda and Delfina for dinner on Tuesday. They're owned by the same restaurant group and price point looks to be the same. I'm wondering if there's a clear winner between the two? 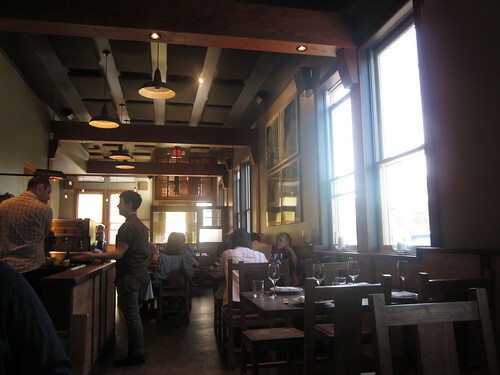 I'll probably choose Delfina based on GAF's review if no case is made for Locanda. Also trying to choose between La Folie, Commis, & Slanted Door for dinner (I need to choose 2 of those 3). Any feedback would be appreciated. 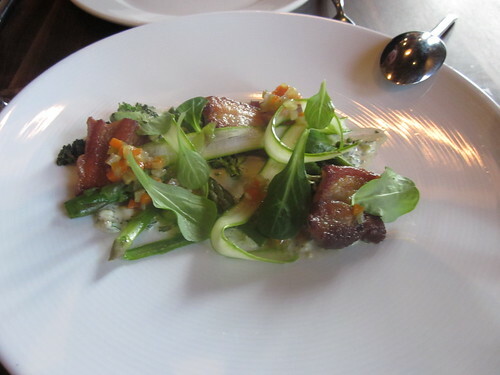 Of the last trio, I would select Commis (I think that some of the shine has worn off Slanted Door of late), but you might also consider Atelier Crenn, which has a very high level of modernist cuisine, and is not super-expensive (for the more expensive possibility, there is Coi). Thanks, GAF. I ruled out Atelier Crenn early just because I was so overwhelmed with higher-end places. But I may reconsider, especially if the Slanted Door isn't all it's cracked up to be. 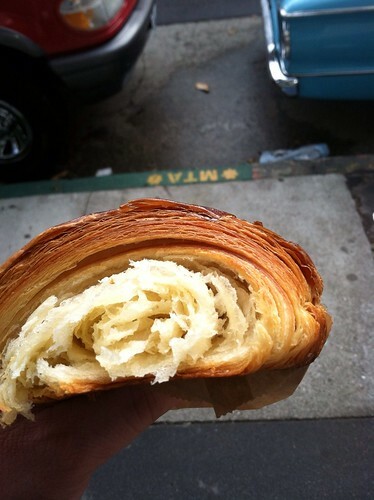 During a short visit to SF last week I thoroughly enjoyed the always transcendent Tartine Bakery (Morning Bun, oh my! Coconut creme, sky high!) and was really glad to get to visit the newish (and highly acclaimed) Mission Chinese, which serves inventive riffs like Salt Cod Fried Rice with Chinese Sausage and Cilantro, and excellent, fiery, intricate MaPo Tofu. 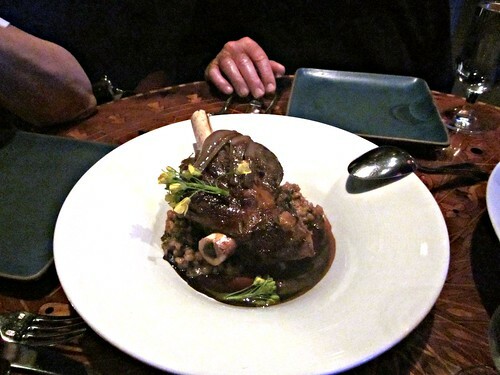 cabrito wrote: I've been appreciating everyone's thoughtful posts on SF restaurants. I'll be vacationing there for 5 days in February and have almost all of my eating plans decided. The Cheese Board is pretty good, but I'm not sure it's worth a special trip. Gregoire across the street is a much better lunch spot. 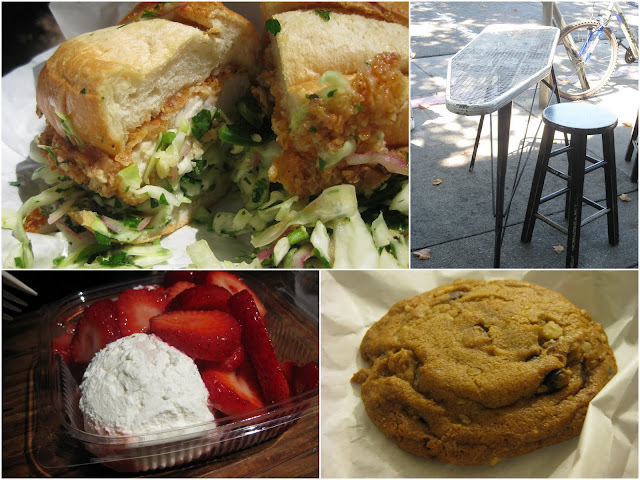 Also, in SF: Arizmendi and Humphry Slocombe. Last edited by cilantro on January 9th, 2012, 6:48 pm, edited 1 time in total. cabrito wrote: Thanks, GAF. I ruled out Atelier Crenn early just because I was so overwhelmed with higher-end places. But I may reconsider, especially if the Slanted Door isn't all it's cracked up to be. Slanted Door (IMHO of course) is overpriced and overrated. Atelier Crenn is so awesome that I am going back there again on Wed.
Had an awesome carnitas burrito at El Farolito Taqueria in the mission. The green salsa was also fantastic. As mentioned upthread Flour + Water is tremendous. Go there. Best croissant ever at Tartine Bakery. Sorry I missed the bread, but this was really good. Dinner at Haven in Oakland was the biggest disappointment of the trip. I'm aware of the pedigree of this place, and that it's only a couple months old so I may have caught them on an off night. Of about 10 courses only two were really good and one of those was bone marrow. The staff was very nice and service was excellent. I'm sorry the food wasn't as good. 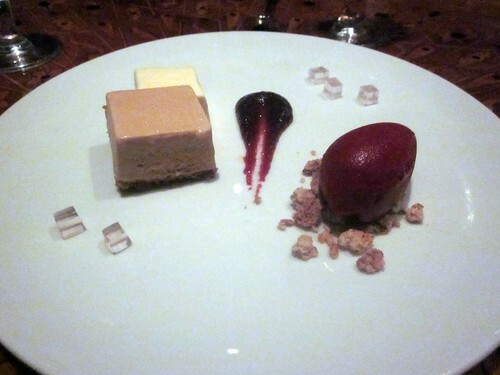 jvalentino wrote: Dinner at Haven in Oakland was the biggest disappointment of the trip. I'm aware of the pedigree of this place, and that it's only a couple months old so I may have caught them on an off night. Of about 10 courses only two were really good and one of those was bone marrow. The staff was very nice and service was excellent. I'm sorry the food wasn't as good. I was at Haven last night and I totally agree. Food was definitely a disappointment. Service was also very flakey for us, since the server kept disappearing, and towards the end of the night we had 2 servers come up and describe the dishes on the table one after another... Sigh... Hoping dinner tonight will be better! Sorry to hear about Haven. I keep reading about misses at Plum, and it seems the new high-falutin' kids on block are already destroying the rep which took Oakland so long to build. That said, in OAK, Adesso is still a good bet, especially during its happy hour. I know it's not new & hip, but the setup just reminds me of Trastevere so much! And let's not forget you can have Pho Ga Huong Que's killer chicken pho (served Hainan style, with proper scallion/ginger oil, better than the fanciful stuff found even at Spice Table) for breakfast. Just back from 3 days in SF. My first visit. Sadly, it was both a brief and not particularly food-centric visit. Nonetheless, it was a terrific trip and I loved pretty much everything I ate. We had 2 11-yr. olds in tow, which meant I got to sample both the Super Duper burger and Jenny's. No idea how local or national these chains are. Both were new to me, and I thought both were excellent in their own terms. Jenny's was near Golden Gate Park and we just ducked in by chance as the boys had become suddenly ravenous. A tiny storefront, not particularly prepossessing. They offer 2 sizes: 6 oz. and 8 oz. for $5 and $5.50, if memory serves. Burgers were cooked medium but still very juicy and flavorful. There was also a toppings bar for customizing. Super Duper was a bit of a Five Guys style operation. Clearly more corporate. Nieman Ranch beef. Lots of organics involved in the shakes, etc. The 2-level joint was jumping, the staff seemed extraordinarily friendly and efficient. I had a "mini-burger" (4 oz. ), others had the full 8 ouncer. Different style from Jenny's, but also cooked medium. Less juicy, but very flavorful. Good bun; soft but holding up to the contents. Excellent fries with great crispness and potato flavor/aroma. The kids loved their organic vanilla shakes. My bro/sis-in-law's building had a casual Indian place at the lobby level called Chaat Cafe. Again, great prices, lots of good fresh flavor, really friendly service. The kids had a tandoori chicken wrap, about which I was a bit dubious, but in fact it was very well done, and the chunks of chicken had excellent flavor. Butter chicken was a very nice version of that standard. I had an excellent lamb curry with nice, balanced heat and good, fresh naan. Wonderful lunch in North Beach at a tiny Italian spot, Osteria del Forno. I may have been experiencing everything through rose-colored vacation glasses but I felt very much like I was back in Italy. Everything on the lunch menu was $7-$9. There was an excellent small wine list from which we indulged in a half bottle of Felsina Chianti '08. Started with slices of porcini pizza bianco. Thin but chewy crust, generous use of mushrooms and wonderful earthy flavor and aroma. The day's special was milk-braised pork roast with herbs served with roasted yams and potatoes. Thoroughly delicious. Meal started with a basked of delicious rosemary foccacia. Penne with roasted tomato was delicious, simple, with pasta perfectly cooked. Meal-ending cappuccino was excellent even without The Last Supper inscribed in the foam. The proprietress was a small, wiry, middle-aged Italian lady who took wonderful care of us, and directed me to the nearest ATM when I noticed the "cash only" notice only after being seated. The waitress, was a young lady, extremely welcoming and efficient, with a ghost of an accent which I assumed was Italian, but turned out to be Austrian. All in all, a perfect vacation lunch on a bright, cool, sunny day in a wonderful city. Osteria del Forno is great - thanks for posting. It's been around a long time and is a favorite among locals, despite being in a pretty touristy neighborhood. I'm glad to read that they are still going strong. jvalentino wrote: Had an awesome carnitas burrito at El Farolito Taqueria in the mission. The green salsa was also fantastic. I lived in the Mission District in SF for around 2 years, and moved out around a year ago. Some friends and I decided to do the grand tour of burrito places there, so I just want to add some notes. La Taqueria is a solid taqueria which seems like it has won Best Taqueria in every newspaper in the Bay Area, and where the price of everything has been marked up around 50%. The food is still good and there are no mistakes on this menu, but you won't be blown away. Go across the street afterwards to Mission Pie, which has locally sourced organic whathaveyou and just all around delicious pies. El Tonayense was always my go-to, the classics done right for the right price. They used to have a storefront right at 24th and Shotwell, but it's now a Jewish deli, so you have to go find their truck on Harrison and 22nd. They make great lengua, and the super burrito is enough for two days. If you're a vegetarian, you want to go to Taqueria Cancun. They make the best veggie burritos in the city, and the one at 19th and Mission is right across from The Dark Room, which puts on live action MST3K called "Bad Movie Night" every Sunday night. Not a taqueria, but because I was thinking about Papalote's mole, the place to go for mole is La Oaxaquena. Delicious Oaxaquan style tamales with a rich deep brown chocolate mole that will have you licking the plates. My favorite gem, which I was for a long time afraid of talking about, is Mr. Pollo, right at 24th and Mission. Chef Manny will give you a 4 course tasting for $20 made of real farm fresh food. There are only two tables in the place, and he cooks everything himself. He's staged at some of the biggest restaurants in the city, and worked at fine dining places all around the country, but wanted a real neighborhood place. It's the dream restaurant. La Balompie is also a good place. Honduran/Salvadorean food. The pupusas are amazing, as is the fried yucca.